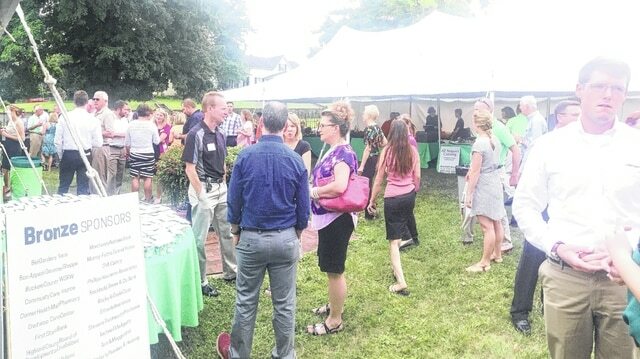 A big crowd of members and supporters of the Highland County Chamber of Commerce turned out Thursday evening for a “Party on the Lawn” on the grounds of the Scott House in Hillsboro. The Highland County Chamber of Commerce held its 25-year celebration called “Party on the Lawn” Thursday evening on the grounds of the Scott House, where the chamber is headquartered. A big crowd of chamber members and supporters turned out under what ended up being dry conditions after rain earlier in the day and the threat of rain later in the afternoon. Chamber President Melissa Elmore said she was thrilled with the turnout and the fact that the weather cooperated. Attendees enjoyed dinner catered by All Seasons Catering, Cow-A-Burger, Batter Up Bakery, Ponderosa, and Farm House Catering. Elmore earlier said the chamber, which currently has approximately 330 members, was created 25 years ago when chambers of commerce in Hillsboro and Greenfield decided to merge. The Highland County Chamber of Commerce is “a membership driven business organization that represents the business community of Highland County. “The many plans and programs the chamber offers its investors, combined with county workforce development initiatives, and local, state, and federal legislative/advocacy efforts positions the Chamber of Commerce as a lead organization in Highland County,” according to an organization description. For more information on the chamber visit www.TheHighlandChamber.com or call 937-393-1111.